For a half a century, the US Navy kept a lid on the details of the incident that prompted this salutation. A Miami news reporter made the first public disclosure in 1958 after he stumbled upon the truth while covering a reunion of the destroyer's crew. The Pentagon reluctantly and tersely confirmed his story, but only a smattering of newspapers took notice. In 1943, the Willie D as the Porter was nicknamed, accidentally fired a live torpedo at the battleship Iowa during a practice exercise. As if this weren't bad enough, the Iowa was carrying President Franklin D. Roosevelt at the time, along with Secretary of State, Cordell Hull, and all of the country's W.W.II military brass. They were headed for the Big Three Conference in Tehran, where Roosevelt was to meet Stalin and Churchill. torpedoes that carried 500-pound warheads. This destroyer was placed in commission on July 1943 under the command of Wilfred Walker, a man on the Navy's fast career track. The William D. Porter on her ill fated deployment. merly valuable pieces of equipment. The Willie D merely had a scraped anchor, but her career of mayhem and mishaps had begun. boat feeding ground, speed and silence were the best defense. Suddenly, a tremendous explosion rocked the convoy. All of the ships commenced anti-submarine maneuvers. This continued until the Porter sheepishly admitted that one of her depth charges had fallen off her stern and exploded. The 'safety' had not been set as instructed. Captain Walker was watching his fast track career become sidetracked. Men Are Just Happier People - What do you expect from such simple creatures? Your last name stays put. The garage is all yours. Wedding plans take care of themselves. Chocolate is just another snack. You can be President. You can never be pregnant. You can wear a white T-shirt to a water park. You can wear NO shirt to a water park. Car mechanics tell you the truth. The world is your urinal. You never have to drive to another gas station restroom because this one is just too icky. about the Willie D's difficulties. It would have been merciful if the force commander had detached the hard luck ship and sent her back to Norfolk. But, no, she sailed on. The morning of 14 November 1943 dawned with a moderate sea and pleasant weather. The Iowa and her escorts were just east of Bermuda, and the president and his guests wanted to see how the big ship could defend herself against an air attack. So, the Iowa launched a number of weather balloons to use as anti-aircraft targets. It was exciting to see more than 100 guns shooting at the balloons, and the President was proud of his Navy. Just as proud was Admiral Ernest J King, the Chief of Naval Operations; large in size and by demeanor, a true monarch of the sea. You don't have to stop and think of which way to turn a nut on a bolt. Same work, more pay. Wrinkles add character. Wedding dress $5000. Tux rental-$100. People never stare at your chest when you're talking to them. New shoes don't cut, blister, or mangle your feet. One mood all the time. Phone conversations are over in 30 seconds flat. You know stuff about tanks. A five-day vacation requires only one suitcase. You can open all your own jars. You get extra credit for the slightest act of thoughtfulness. If someone forgets to invite you, he or she can still be your friend. Your underwear is $8.95 for a three-pack. Three pairs of shoes are more than enough. You almost never have strap problems in public. You are unable to see wrinkles in your clothes. Everything on your face stays its original color. The same hairstyle lasts for years, even decades. You only have to shave your face and neck. You can play with toys all your life. One wallet and one pair of shoes -- one color for all seasons. You can wear shorts no matter how your legs look. torpedo at him would mean. Over on the Willie D, Captain Walker watched the fireworks display with admiration and envy. Thinking about career redemption and breaking the hard luck spell, the Captain sent his impatient crew to battle stations. They began to shoot down the balloons the Iowa had missed as they drifted into the Porter's vicinity. If Laura, Kate and Sarah go out for lunch, they will call each other Laura, Kate and Sarah. If Mike, Dave and John go out, they will affectionately refer to each other as Fat Boy, Bubba and Wildman. EATING OUT When the bill arrives, Mike, Dave and John will each throw in $20, even though it's only for $32.50. None of them will have anything smaller and none will actually admit they want change back. When the girls get their bill, out come the pocket calculators. A man will pay $2 for a $1 item he needs. The average number of items in the typical woman's bathroom is 337. A man would not be able to identify more than 20 of these items. A woman has the last word in any argument. Anything a man says after that is the beginning of a new argument. A woman worries about the future until she gets a husband. A man never worries about the future until he gets a wife. A woman marries a man expecting he will change, but he doesn't. A man marries a woman expecting that she won't change, but she does. A woman will dress up to go shopping, water the plants, empty the trash, answer the phone, read a book, and get the mail. A man will dress up for weddings and funerals. Men wake up as good-looking as they went to bed. Women somehow deteriorate during the night. through naval history, although words to the effect of Farragut's immortal 'Damn the torpedoes' figured centrally within. thrown the used primer over the side to conceal his mistake. The whole incident was chalked up to an unfortunate set of circumstances and placed under a cloak of secrecy. Someone had to be punished. Captain Walker and several other Porter officers and sailors eventually found themselves in obscure shore assignments. Dawson was sentenced to 14 years hard labor. President Roosevelt intervened; however, asking that no punishment be meted out for what was clearly an accident. Initially there was some reluctance to admit what had happened, or even to warn the Iowa. As the awful reality sunk in, people began racing around, shouting conflicting instructions and attempting to warn the flagship of imminent danger. First, there was a flashing light warning about the torpedo which unfortunately indicated the torpedo was headed in another direction. Next, the Porter signaled that the torpedo was going reverse at full speed! Finally, they decided to break the strictly enforced radio silence. The radio operator on the destroyer transmitted "'Lion (code for the Iowa), Lion, come right." The Iowa operator, more concerned about radio procedure, requested that the offending station identify itself first. Finally, the message was received and the Iowa began turning to avoid the speeding torpedo. was now some thought that the Porter was part of an assassination plot. Within moments of the warning, there was a tremendous explosion just behind the battleship. The torpedo had been detonated by the wash kicked up by the battleship's increased speed. The crisis was over and so was Captain Walker's career. His final utterance to the Iowa, in response to a question about the origin of the torpedo, was a weak, "We did it." Shortly thereafter, the brand new destroyer, her Captain and the entire crew were placed under arrest and sent to Bermuda for trial. It was the first time that a complete ship's company had been arrested in the history of the US Navy. The ship was surrounded by Marines when it docked in Bermuda, and held there several days as the closed session inquiry attempted to determine what had happened. The destroyer William D. Porter was banished to the upper Aleutians. It was probably thought this was as safe a place as any for the ship and anyone who came near her. She remained in the frozen north for almost a year, until late 1944, when she was re-assigned to the Western Pacific. However, before leaving the Aleutians, she accidentally left her calling card in the form of a five-inch shell fired into the front yard of the American Base Commander, thus rearranging his flower garden rather suddenly. In April, 1945, the destroyer Porter was assigned to support the invasion of Okinawa. 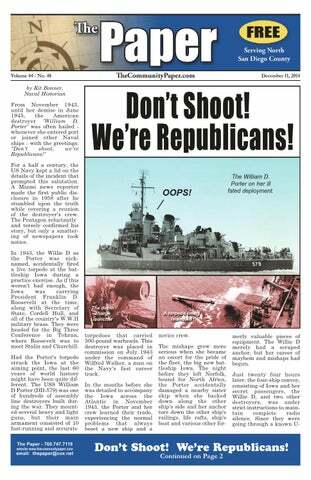 By this time, the greeting "Don't Shoot, We're Republicans" was commonplace and the crew of the Willie D had become used to the ribbing. But the crew of her sister ship, the USS Luce, was not so polite in its salutations after the Porter accidentally riddled her side and superstructure with gunfire. On 10 June, 1945, the Porter's hard luck finally ran out. She was sunk by a plane which had (unintentionally) attacked it from underwater. A Japanese bomber made almost entirely of wood and canvas slipped through the Navy's defense. Having little in the way of metal surfaces, the plane didn't register on radar. A fully loaded kamikaze, it was headed for a ship near the Porter, but just at the last moment veered away and crashed alongside the unlucky destroyer. There was a sigh of relief as the plane sunk out of sight, but then it blew up underneath the Porter, opening her hull in the worst possible place. Three hours later, after the last man was off board, the Captain jumped to the safety of a rescue vessel and the ship that almost changed world history slipped astern into 2,400 feet of water. Not a single soul was lost in the sinking. After everything else that happened, it was almost as if the ship decided to let her crew off at the end. Take a good look at this sketch of a man who is wanted for exposing himself to a girl in San Marcos. She immediately ran away and reported the incident to San Marcos High School administrators and the Sheriff's Department. The man was wearing sunglasses, a black jacket and faded blue jeans. If you recognize the man in the sketch or have information on this incident, call the Sheriff's non-emergency line at (858) 565-5200. You can also call the Crime Stoppers anonymous tip line at (888) 580-8477. You may be eligible for a reward of up to $1,000 for information that leads to an arrest. It happened just after 8:00 a.m. on Tuesday, December 2nd near South Rancho Santa Fe Road and Las Cruces Avenue. The victim told deputies she was walking to San Marcos High School when she was approached by a man asking for directions to Palomar College. She tried to show the suspect using the map function on his cell phone, which he was holding at waist level. That's when the victim realized he was exposing himself. They say that Charlie’s Restaurant is a “Family Restaurant.” What better proof than the fact that there are several sets of family members who have worked there for years . . . in addition to Charlie and his daughter, Suzie, there are sisters Tracy and Terri, and mom and daughter, Fran and Tina. Charlies has a number of longtime employees. They seem to like it there. . . Charlies likes them. . . and so do the customers. ••••• I remember the first time I walked into Steve Heilman’s new chiropractic offices in Escondido. Wow! Beautiful carpeting, warm, comfy, luxurious feeling. Kiwanian for years. He had also treated me for various aches and pains and done so admirably. Letters to the Editor On Iran . . .
We especially appreciated your timely story entitled "The People Who Are . . . The Enemy?" which appeared in the 20th November 2014 issue of "The Paper." unrest in that part of the world but rather the fanatical leadership, both religious and political. now located at 700 W El Norte Pkwy #205, Escondido, CA 92026 (760) 480-4480. His adjusting rooms carry on the relaxing mood and atmosphere. State of the art equipment, including deep tissue laser, ultrasound, electronic stimulation, all await your needs. One of the adjusting rooms and science as well as the latest in the way of equpkment available to ease your pain. short people living in the house. 'Twelve thirty..' ••••• Two Irish nuns have just arrived in USA by boat and one says to the other, "I hear that the people in this country actually eat dogs." "Odd," her companion replies, "but if we shall live in America, we might as well do as the Americans do." As they sit, they hear a push cart vendor yelling, "Hot Dogs, get your dogs here," and they both walk towards the hot dog cart. "Two dogs, please!," says one. Tech support: Click on the 'my computer' icon on the left of the screen. Customer: left? rulers, not the people!" With the ice broken on both sides, so to speak, we were able to enjoy a pleasant and amicable conversation thereafter. I learned that they were professional photo-journalists who were in Singapore to cover the Iranian soccer team which was in the republic for regional play-offs in preparation for the World Cup which was to be played later that year in Spain. I mentioned that my wife was Singaporean and that we had been resident in the country for around a decade. More Magic Castle . . .
HOLLYWOOD CALLING! Hi, Lyle! Just got a call from Hollywood, Thursday, December 4, 2014. It was from Milt Larsen, my uncle and owner of Hollywood's The Magic Castle. I rarely hear him sound this excited as he did upon reading my article on "The Real World of Harry Potter," which you published in The Paper, November 27, 2014. I mailed him copies of my article without telling him about the storyline, and surprising him with it! Well, my dear Uncle Miltie was so hyper-excited over the manner that it was written and said he actually read, then re-read the story in The Paper several times over, in succession! at 230 E. Park Escondido, 92025. On the day we visited his offices he was treating a patient with his deep tissue laser equipment. I have been an advertiser in The Paper for more than ten years. The advertisements keep my name in the public together with the addition of new clients from geographical areas outside my office location in San Marcos. The key to successful advertising in a newspaper is repetition. The ads should be weekly if it fits within your marketing budget, otherwise the ads should be at least monthly to be effective. One ad will not likely bring new customers. Dr. Steve’s Laser Therapy equipment is the same equipment over 40 professional sports teams use to treat their highly prized (and paid) athletes. Whether it’s that pesky arthritis, or a strained muscle in your body, Dr. Steve and his state of the art Laser Therapy can help you heal more quickly and suffer less pain. As a bonus, when you call Dr. Steve Heilman, you’ll get to meet his receptionist, Allie. and took off on a ride of their life. It was suggested that the riders be one adult and one child; a perfect combination to inspire the next generation of pilots. As many of you know, the Legislature reconvened on December 1st. I joined all 79 of my Assembly colleagues, including 27 newly-elected freshmen, when I took the oath to serve the people of California for the coming legislative session. San Marcos Theatre West Presents Annie Jr. - The City of San Marcos Theatre West Youth Theater will present the musical production of Annie Jr. at the San Marcos Community Center, 3 Civic Center Drive on December 12, 13, 14. Show times are Friday at 7:30pm, Saturday at 2pm and 6pm, and Sunday at 2pm. The show features a cast of 45 local actors aged 7 to 17. Ticket prices are $7 for youth/students/seniors and $10 for adults. Tickets for the 2pm show on Saturday are $7 for all ages. Tickets are available in advance or may be purchased at the door. For more information, go to www.san-marcos.net/theatrewest or call 760.744.9000.
measures to receive full and fair consideration during legislative debate. This year’s 27 new Assemblymembers will join 43 freshman who entered the Assembly after the 2012 elections. As a result, the Democratic super-majority has been eliminated in both houses and the Assembly has been remade. The addition of so many new legislators over the past two years led to more cooperation and less bickering. Though we will still disagree on many fundamentals, the elimination of most of the highly partisan old-guard should result in better policy making. That’s why I am so happy with my new position as Floor Leader. My job will involve dealing with members on both sides of the aisle so that the people’s business can be conducted smoothly, efficiently and with mutual respect, even when we disagree. The people of California deserve no less. Senator Joel Anderson to Speak at TERC Meeting - State Senator Joel Anderson, who represents California’s thirty-sixth senate district consisting of San Diego and Riverside Counties, will be the guest speaker for The Escondido Republican Club’s (TERC) meeting on Monday, December 15th. Senator Anderson will provide an up-to-date report on the outcome of the November 4th General Election results as they relate to our State’s future. The meeting will be held at the Cocina del Charro Restaurant, 890 West Valley Parkway, Escondido. Check-in begins at 11:15am; buffet luncheon starts at 11:45am. The meeting begins promptly at noon and concludes at 1pm. A reservation is necessary. minor injuries. The driver, identified as Jose De Jesus Garcia, 19 years old, of Escondido, was transported to Palomar Medical Center where he later died as a result of his injuries. Customer: A teddy bear my boyfriend bought for me at the 7-11. ••••• Customer: My keyboard is not working anymore. Tech support: Are you sure it's plugged into the computer? Customer: No. I can't behind the computer. Tech support: Pick up your keyboard and walk 10 paces back. Tech support: Did the keyboard come with you? tor, but the computer still says he can't find it. ••••• Tech support: What's on your monitor now, ma'am? Customer: Five dots. ••••• Customer: I have a huge problem. A friend has placed a screen saver on my computer, but every time I move the mouse, it disappears. ••••• This one and the next are our personal favorites! A woman customer called the Canon help desk with a problem with her printer. Customer: 'No, my desk is next to the door, but that is a good point. The man sitting in the cubicle next to me is under a window, and his printer is working fine.' ••••• Tech support: 'Okay Bob, let's press the control and escape keys at the same time. That brings up a task list in the middle of the screen. Now type the letter 'P' to bring up the Program Manager.' Customer: I don't have a P. Tech support: board, Bob. Customer: mean? as “yellow journalism.” Pulitzer opened the way to mass-circulation newspapers that appealed to readers by offering a multiple taste in news, entertainment and advertising. Pulitzer joined the Republican Party through which he was able to land a reporting job for the St. Louis Westliche Post. When GOP leaders needed a candidate to fill a vacancy in the State Legislature, they settled on Pulitzer, forgetting he was only 22 -- three years under the minimum age. However, his chief Democratic opponent was ineligible because he had served in the Confederate army. Pulitzer won by a 209-147 vote. Most people today have heard of the coveted “Pulitizer Prizes” but few know what they are, is, or for whom they were named. His age was not made an issue and he was seated as a Missouri state representative beginning in 1870. Pulitzer lived in Jefferson City for only two years, all while keeping his reporting job for the Westliche Post. The Prizes are named for Joseph Pulitzer, who was born in 1847 in Hungary. He became one of America’s most famous and successful newspaper publishers, starting with the St. Louis PostDispatch and later the New York World. The cost is $14 per person. To RSVP, call 760.807.5827. For more info about TERC, visit www.escondidorepublicanclub.com. Tri-City Tea Party to Hold Annual Christmas Party – Hear Vista’s newest city councilman, John Franklin, at Tri-City’s Christmas Party on Tuesday, December 16, from 6-8pm, at the home of Rob and Jennifer Morse in Vista. This is a potluck – bring your favorite dish; roast turkey and ham will be provided. Also, there will be free raffle prizes. Marines will collect Toys for Tots; please bring an unwrapped toy. For address and gate code, contact Milli at 760.494.7703 or millipala@gmail.com. High School Music Boosters to Wrap Gifts as a Fundraiser - The Escondido High School Music Boosters will be wrapping Christmas gifts this season at Barnes and Noble, 810 West Valley Parkway in Escondido, to raise funds to purchase new uniforms for the marching band. Student volunteers and music boosters will be at the store on Saturday, December 20 (7:00am-1:00pm); Sunday December 21 (5:00pm9:30pm); Tuesday, December 23 (9:15am-10:00am and 5:00pm9:30pm); and Wednesday, December 24 from 3:00pm-6:00pm for last minute shoppers. There is no fixed charge for the gift wrapping, but all donations are gratefully accepted. Band Director Phil Felix said the average life of a marching band uniform is 8-10 years. “We’ve been using these uniforms for 14 years now,” he said. In addition, the band has been growing each year. “If that continues, we won’t have enough usable uniforms for all the students who want to be in the marching band,” Mr. Felix said. For more information, contact Mr. Felix at Escondido High School, 760-291-4000. Figment.com. Bring an I-pad or pad and pencil, with your imagination. If you like to write and have fun, this is for you! Contact rmdellorfano@gmail.com or call 760.752.3111. Christmas Concert with Peter Pupping Band – On Saturday, December 20th, at 7:30pm, the Peter Pupping Band with Tim Holcombe will present a Christmas concert with a Latin and country twist, featuring classical and traditional pieces as well as Nuevo flamenco renditions of favorite Christmas songs. Singer/songwriter Tim Holcombe will join the quartet, which includes two classical guitars, upright bass and percussion. The concert will be held at the Meadowlark Community Church, 1918 Redwing St., San Marcos. General admission is $15 at the door or online at www.guitarsounds.com. For more info, call 760.943.0755, Peter Pupping. A Gift for Someone Who Has Everything–Including Pets – The San Diego Pets Magazine tells you how to have more fun with your pet(s). From the dog-friendly beaches and parks to the array of petfriendly restaurants, having a pet in San Diego County is already a pretty terrific experience, but now it can be even better. Co-published by San Diego Magazine and San Diego Humane Society, the magazine offers animal-friendly features, resources, training tips and stories for animal lovers. The website features petfriendly events throughout the county, animals available for adoption, a photo of the day, and more. Get upto-the-minute information, news, and tips about the best dog parks and pet festivals in town through Twitter and Facebook. To flip through a digital version of the inaugural issue or for subscription information, visit www.sandiegopetsmagazine.com. Art: The Perfect Gift – Brandon Gallery is presenting artful gifts for the season. Over 100 pieces of art priced for gift giving under $100, plus unique gifts, jewelry, cards, ceramics, fiber art, and for the artist custom gifts of art supplies, and don’t forget Gift Certificates. Free gift wrapping except for large wall art. Brandon Gallery is located at 105 N. Main, Fallbrook, phone 760.723.1330; a division of Fallbrook Arts, Inc.
* City of San Marcos: COMMUNICATION & E-GOVERNMENT • The most frequently cited source for city-related information was the City’s newsletter, mentioned by 39% of respondents. Of newspapers . . .
and the U-T / San Diego Union Tribune (15%). EAP studio artists, Renee Richetts, Gallery Too, Carrie Repking, and Woody Woodaman, from December 12-January 3. The Municipal Gallery is located at 262 E. Grand, Escondido; phone 760.480.4104. Gallery hours are 11am-6pm on Tuesday (Farmer’s Market), 11am4pm Thursday, Friday, and Saturday. Above, Snow comes to Escondido! Below Left, The White Princess and Wooden Soldier, below right, Ol’ Santa! was a delegate to the Democratic national convention and a member of its platform committee from Missouri. In 1883, Pulitzer, by now a wealthy man, purchased the New York World from Jay Gould for $346,000, and began emphasizing human-interest stories, scandal, and sensationalism. In 1895 Pulitzer introduced the popular Yellow Kid comic strip, the first to be printed in color, which was used for editorial comment instead of mere humor. In 1895, Hearst purchased the rival New York Journal from Pulitzer's brother, Albert, then the two embarked on a circulation war. This competition with Hearst, particularly the coverage before and during the SpanishAmerican War, linked Pulitzer's name with “yellow journalism” because of the caustic editorializing in the Yellow Kid comic strip. Historians point to the combative journalism between Hearst and Pulitzer, arguably, as one of the primary causes for the SpanishAmerican War. The two publishers prodded President McKinley toward war and when the USS Maine was sunk in Havana Harbor, Hearst and Pulitzer started a war of words and pictures of their own. Pulitzer put great stock in his reporting staff. He was once asked “… why it is that you always speak so kindly of reporters and so severely of all editors?" "Well," Pulitzer replied, "I suppose it is because every reporter is a hope, and every editor is a disappointment." Today, his name is kept alive with the Pulitzer Prizes, which were established in 1917, through a grant to Columbia University. The prizes are given annually to award achievements in journalism and photography, as well as literature, history, poetry, music and drama. Right before he died in 1911, Pulitzer founded the Columbia School of Journalism with a philanthropic bequest, which was opened in 1912. Hi, I am Molly, a female 2 year old grayish black sweet labrador retriever. I will be spayed shortly. I was at Downey Animal Shelter and the Puppy Coalition Foundation pulled me from certain death. I look a fright with scars from bad treatment by people and still lactating. I had given birth to my newborn puppies and someone took them away and threw me into the streets of Los Angeles to fend for myself. I was weakened from nursing pups and just trying to stay alive. Then on Nov 22, the dog catcher picked me up. They believe that people kept me long enough for me to have my puppies. They then took them to sell and dumped me in the streets. It was hard surviving on the streets in my condition plus I was distressed about my babies. They weren't even ready to leave me and probably won't make it. My picture probably shows my distraction about them. Emmy is the pet of the week at your Rancho Coastal Humane Society. She’s an 11 month old, 13 pound, West Highland Terrier / Poodle mix (a Westie-poo). She’ perfect for somebody who want a young dog, but not necessarily a puppy. Emmy loves dogs and kids. She will do great with an active family that will continue her training and include her in everything they do. She was transferred to Rancho Coastal Humane Society through FOCAS. The $145 adoption fee for Emmy includes medical exam, vaccinations, spay, and microchip. Find your best friend at Rancho Coastal Humane Society at 389 Requeza Street in Encinitas or log on to SDpets.org. Call 760-7536413 for more information. Kennels and Cattery open 11 AM to 5 PM Wednesday through Monday. Volunteers say I am sweet and take treats gently. I am hoping for a good Christmas. Praying hard and hope to see you real soon. This sweet little lady just loves to share her affection with everyone she meets. Her playful puppy antics and gentle manners are sure to keep her new family laughing. She can often be found giving affectionate kisses and snuggling close to anyone who pets her. She is very curious about the world around her and loves to investigate new sights and sounds. She will proudly sit for a treat and is incredibly gentle. Picadilly is available for adoption at San Diego Humane Society’s Escondido Campus at 3450 East Valley Parkway. To learn more about making her part of your family, please call (760) 888-2275 or visit www.sdhumane.org. New Song Church’s building: 3985 Mission Avenue, Oceanside = 4:00, 5:30, 7:00 and 11 p.m. Alamosa Park on Mesa Drive, Oceanside = 5:00 p.m. The Regal Cinema: 401 Mission Ave., Oceanside = 6:30 p.m. The Bonsall Community Center: 31505 Old River Rd., Bonsall = 4:00 and 5:30 p.m. If you are interested in a really great companion, please call Bruce at the Puppy Coalition. Bruce, a volunteer said my best chance at being saved is this ad. He said that just maybe one good person out there would see my little ad and have feelings for me and take me to their home. Is that you? So if I could have just one chance at a loving home, I would forever show my appreciation. You see I never had one. I have scars to show that. Picadilly, a 3-year-old Labrador Retriever mix, is looking for a loving family to call her own! Why would you want to attend a Christmas Eve service? 1. Because of Jesus. Jesus is the reason for Christmas. People gather to celebrate his birth. On a global scale, the two highest-attended events in history are: 1. Easter church services. 2. Christmas Eve church services. Between 2 and 2.3 billion people attended Easter church services in 2014, making it the largest decentralized gathering of people in the history of the world. Christmas Eve 2014 will be the second highest attended event. 2. For pure enjoyment. Everyone the world Christmas carols. 3. For the sake of your children. Christmas is every child’s favorite holiday. Christmas Eve church services are the warm-up. 4. To receive a free gift. Every guest will receive a copy of The God Questions, by Dr. Hal Seed. 5. To diminish materialism. We’ll remind you that the reason we give gifts is because God gave us his greatest gift on Christmas. With eight services in four locations there is a joyful celebration near you. Join us for joy this Christmas! 7. Here’s a preview: http://vimeo.com/77226323. Last year Dr. Seed filmed a special Christmas message from the town of Bethlehem. Please enjoy! Categories include: Arts, Business, Community, Education, Public Safety, Historic Preservation, and Youth. The deadline for nomination is 5:00 p.m. on Tuesday, January 27, 2015. A sub-committee of the City Council will review all nominations and make its final selection in early February. The awards will be presented at the Annual State of the City Address on Wednesday, February 25, 2015. Planning on going away for the holidays? Call the Vista Sheriff’s Senior Patrol for a vacation home check at 760. 940.4434. The Senior Patrol will drive by and check your home when you’re away. In addition, Vista Fire is urging residents to be careful if they are displaying Christmas trees. Even flame-retardant trees are capable of burning explosively and spreading fire through a home quickly. The following tips will help keep you and your family safe during the holidays. Look for freshness with • cut trees. If purchasing an artifi• cial tree, choose one that is labeled fire resistant. Cut two inches off the • base and immerse the cut end into water immediately. Check the water in the tree stand often. Position the tree away • from fireplaces, direct sunlight and other sources of heat that can cause the tree to ignite. Decorate trees safely • with UL-approved miniature lights to prevent heat buildup. Inspect used lights for • frayed wires or signs of wear. Discard if damaged. Turn off or unplug tree • and exterior lights before leaving the house or going to bed. ious and very, very well thought out. The "pulling aside of the curtain" to reveal a secret, with the Magic Castle structure shown in the artwork was beautifully done, along with the vestige of the words "The Magic Castle" partially perceived, all fitted in nicely with the magical storyline. The dove in flight gave the whole layout an animated feeling of magic. Bravo, Troy. Much is being said about your work! Bravo, again! You earned every praise! /s/Frederick Escondido, CA Lyle. With the holiday season in full swing, remember to shop in San Marcos this holiday season. When transactions are made locally, sales tax revenue is generated for important city services. Buying local also saves time and resources for residents and helps build the backbone of our local economy. Please remember to shop and dine in San Marcos this holiday season. When should you buy your new notebook/desktop PC? 15th. Some artists painted the sculptures in acrylic or watercolors, while others added elaborate feathers and 3-D qualities. Each chicken has been described as “having a personality all its own.” Funds raised from the chicken sculptures will support the San Marcos Arts Council’s mission to “foster and promote an arts environment that enriches the community and envision a culturally exciting and artistically vibrant community wherein all forms of the arts flourish.” Through the help of the community, the Council utilized the Chicken Parade to raise revenue for arts programming for fiscal years 2015-2016. For those looking to get involved, volunteer or make a meaningful donation to the San Marcos Arts Council, please contact Board President, Marilyn Huerta, or Chairman, Craig Garcia, at www.SanMarcosArtsCouncil.com. The majority of home and business users want nothing to do with Windows 8. Until Microsoft releases a replacement for Win 8, Win 7 will be the only reasonable operating system (OS) choice for new PCs or upgrades. On October 31st Microsoft stopped selling Win 7 Home Premium licenses to PC companies making it even more difficult to find Win 7 PCs in retail stores. 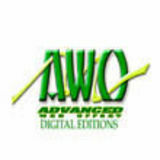 Now independent PC builders, like us, are the only real source for new Win 7 notebooks and desktops PCs. to a year). That means that Win 10 will not be a practical alternative to Win 8 until mid 2016 at best. Microsoft will support Win 7 through April of 2020. The new notebook and desktop PCs we build and sell and the PCs that we upgrade will continue to be based on Win 7 until Microsoft comes up with a proven replacement for Win 8. We purchase Win 7 licenses in hundred piece lots and maintain a large safety stock to protect our ability to continue to produce and upgrade Win 7 products. free monthly event, Oceanside Art Walk has already introduced both new and established artists and artisans to thousands of cultural enthusiasts as it continues to draw audiences from San Diego to L.A. and beyond. Apply online at http://www.oceansideartwalk.org/sub mit/artists or email to artist@oceansideartwalk.org. To learn more about Oceanside Art Walk go to www.oceansideartwalk.org. She’ll be happy to book your appointment. And when you meet Dr. Steve . . . be sure and tell him the Man About Town sent you in. Then, just relax and let Dr. Steve help chase away your pain and its causes. ••••• Recently, Assemblymember Marie Waldron recognized some pretty good friends of ours, Paul and Nome Van Middlesworth, owners of The Computer Factory in San Marcos. The Computer Factory features quality computers, sales and service in San Marcos and has for years. The owners, Paul and Nome Van Middlesworth, combine computer savvy with local customer service that’s often not available elsewhere. Having served as a vice president of operations with high-tech companies like Packard Bell and United Telcom, Paul gained vast experience in the computer field, though he had never worked in a retail environment. Nevertheless, when the opportunity to open their own computer store in San Marcos arose in 1995, Paul and Nome jumped at the chance. Despite competition from big box stores, the ability to give customers what they want by providing local sales, advice and repair service has made The Computer Factory a success. In addition to running a successful business, Paul has served as a board member of the San Marcos Chamber of Commerce, including stints as membership chairman and incoming board chairman for 2015. Paul has also served as president of two local Lions Clubs, and is a founding member of Mission 316 Church. By combining entrepreneurial success with community involvement, small business owners like the Van Middlesworths enrich their communities. For these reasons, Assemblymember Waldron was very pleased to name The Computer Factory my Business of the Month for November, 2014.
break into a house in an unincorporated area of Escondido, authorities said. San Diego County Sheriff’s Department responded to the 2000 block of Rancho Verde Drive at 8:20 a.m. when a resident chased an attempted burglar out of their house, deputies said. services. For additional info, visit www.mthealth.org. Local Council of Community Clinics Received Grant – Five members of the Council of Community Clinics received $1.25 million from the U.S. Department of Health and Human Services to “establish or expand behavioral health services.” Each of the five received $250,000; the local clinic being the North County Health Services. The funds will enable health centers to hire new mental health professionals, add mental health and substance use disorder health services, and employ integrated models of primary care. The Council of Community Clinics and its subsidiaries represent and support community clinics and health centers in their efforts to provide access to quality health care and related services for the diverse communities they serve with an emphasis on low income and uninsured populations. For more information, please visit www.ccc-sd.org. Neighborhood Healthcare CEO Tracy Ream already has plans for their grant. The organization will add a full-time behavioral health provider with experience in substance abuse and will also implement screening and treatment for substance use disorders. “The funding is critical,” she said, “because in our North Inland service area, nearly 300 individuals per 100,000 of the population were diagnosed with an acute alcoholrelated disorder in 2011, and some 80 per 100,000 were diagnosed with a substance-related disorder.” She added that hiring a behavioral health provider will also create more access to services for those patients who could benefit from health behavior change interventions. Jean Lydia Kraus, 86, of Escondido, CA., passed away on December 2, 2014. Jamie Louise Reed, 56, of Valley Center, CA., passed away December 03, 2014. Ruth Elizabeth Phillips, 91, of Fallbrook, CA, passed away on December 7, 2014. James C. Hoshor, 90, of San Diego, CA., passed away on December 6, 2014. Clifford Paul Jennings, 80, of Escondido, CA., passed away on December 6, 2014. Isn't this the cutest picture of a boy, a dog and a tree? Wishing you a very Merry Christmas everyone at the Escondido History Center, and the Greaves home, circa 1930. The finest compliment I can ever receive is a referral from my friends and clients. Veterinary Services No Excuses! We Get It Sold! Make Your Homes Ready! Christmas is coming up fast! Roast the turkey, make the dressing, plenty of pies, ice cream, family, friends! ed in a DUI Saturation Patrol. Officers assigned to this detail made 44 traffic stops and conducted 6 Field Sobriety Tests. During the evening, no drivers were arrested for DUI. 1 driver was arrested for two felony warrants. 1 driver was arrested for auto theft and narcotics possession. 7 drivers were cited for being unlicensed or having a suspended license. 4 vehicles were impounded. 1 stolen vehicle was recovered. Regular $49.50. Limit one per household. Coupon must be presented at or before payment. manager, said the establishment is cooperating with law enforcement and will remain open serving only food until the suspension is lifted. Poorman said the employee was the “one bad apple” that caused a major problem. While the transaction occured outside the restaurant the initial contact was inside. The state Alcoholic Beverage Control office confirmed that the restaurant will also be on probation for two years. The license suspension will be in effect through Dec. 28. Oceanside police participated in the operation. A spokesman said the department routinely conducts undercover sting operations to make sure businesses follow ABC rules. A man was injured in a highspeed crash early Saturday morning in Vista, according to the Sheriff's Department. Deputy reports indicate the motorist drove onto the center median on South Melrose Drive near Aspen Way and crashed into a tree about 2:30 a.m. Emergency crews from the Carlsbad Fire Department hadto extricate the man from the vehicle. He was then taken to Palomar Medical Center with serious head and leg injuries. The crash is under investigation. At press time, the name of the motorist had not been released. Baha’is have been described as a kind, gentle people. Would you like to know more? Call anyone listed here from your city/neighborhood. Be a guest of Bahai’s! Learn more about what we believe. Visit one of our meetings. Call a Baha’i in your city for more information! Palomar College officials have decided to bring to a close two longrunninbg programs on KKSM Radio, that of the Doug Best Swings Show and Sharon’s Show. Palomar College plans to utilize those time slots to train young college students in the broadcasting art. For over 50 years, Doug Best has been bringing the big band sound to radio listeners throughout San Diego County; Sharon Prince has been presenting ‘theme radio’ along with humor and helpful hints. Now, a new generation of broadcasters begin to learn their profession. We hope you will join us this Saturday to thank both Doug and Sharon for hours and years of wonderful entertainment and wish them well in their retirement. Two outstanding broadcasters . . . we hate to say good-bye, but must . . . and so, reluctantly, we bid farewell to these two wonderfully talented folks. Perhaps you’d like to call on-air and wish them well. The radio station number is 760.744-1150 x5576 (During Doug and Sharon’s Shows only). "Arthritis Joint Pain Gone Within Weeks with Laser Therapy"
Living with Arthritis pain can affect every part of your life. It keeps you from enjoying the good things in life - time with grandkids, playing golf, even working in the yard. Wouldn’t it be nice to get out of bed without pain for just one morning? Every time you try and push through the pain... like standing or walking for a long period of time.. . you pay for it for the next 2-3 days with even more pain. So, you take some pain pills... Pain Pills Are Not the Answer Do you remember the Vioxx scandal? It was a medication designed to relieve arthritis pain... but like all drugs, it had side effects. After years of use worldwide, the makers withdrew it from the market because of the overwhelming evidence it caused heart attacks and strokes. There’s a time to use pain medications, BUT not before seeking a natural way to correct the CAUSE of the problem! Ask yourself... after taking all these pain medications... maybe for years... are you any better off? Do You Have Any of these Arthritis-related Symptoms? older- that you should expect to have Arthritis? Sure, if you don't take care of your damaged joints now as you get older they will get worse. However, old age is not the cause of your Arthritis. I'll venture to say all 360 joints in your body are the same age, yet Arthritis and joint degeneration has not affected every one of them - only your previously injured joints that never healed properly. My name is Dr. Stephen Heilman, D.C., owner and clinical director of North Inland Pain Relief Institute. Over the past 15 plus years, I have seen thousands of people come in to my office that were suffering from Arthritis pain. After treatment, they often leave the institute pain free or with significantly reduced pain. How can we achieve these results? It is quite simple: our years of experience and a dedication to the safest and most effective healing technologies - like Nexus Laser Therapy. We have made it our institute's mission to help those suffering with chronic pain like you. What is Laser Therapy? Laser Therapy is on the cutting edge of pain relief. Laser Therapy provides healing energy to the tissues that are swollen, painful, stiff, and inflamed from Arthritis. You are in pain because there is damage to the soft tissues of the body: muscles, tendons, ligaments, and the tissues surrounding the joints.Laser Therapy significantly benefits these injured tissues by speeding up the healing process, by decreasing pain, and by reducing inflammation faster than comparable therapies. Pain Is Not Just "Old Age"
around the world and by professional sports teams. In fact, we have the same laser used by over 40 professional sports teams, including the Los Angeles Dodgers, New York Rangers, and Boston Celtics. So when Laser Therapy is added to the conventional physical therapies, the results are amazing. By the way, the treatment is painless! Is This Solution Right For You! I. An in-depth consultation about your health and well-being where I will listen... really listen... to the details of your case. 2. A complete joint, muscle and ligament exam. 3. A thorough analysis of your exam findings so we can start mapping out your plan to being pain free. 4. I'll answer your most probing questions about Arthritis problems and how Nexus Class 4 Laser Therapy can help. Until December 17, 2014 you can get everything I've listed here for only $47. Dr. Stephen Heilman, D.C. P.S. Remember, you only have until December 17, 2014. Feel the Improvement; Say "Yes" to Life again! Arthritis Can Be Successfully Treated "I have suffered with a painful knee ever since the Vietnam War. Before this laser treatment, I had pain whenever I went up or down the stairs. I went through several injections, wore knee braces, and had all kinds of tests and none of it worked at all. Dr. Heilman thought that Laser therapy could help me and he was right. The treatment felt really good and you could actually feel it working. The pain is so much less that I can walk up and down the stairs again.” Joe Heard, Escondido, CA. With our "Arthritis Laser Evaluation," we can find the problem and then correct it. Think of how you could feel in just a few short weeks. Laser Therapy can help your life change for the better. Start your body on the way to pain-free, normal living. Feel your stiff and painful joints rest, relax, and finally have less pain. Feel your knotted muscles become more supple and feel the strength in your muscles increase. As you begin to see motion returning to your joints, you are reducing chances of immobility and disability - a crippling future that you can prevent. You're playing golf again, exercising again, playing with your grandkids again, and even walking with that spring in your step again! Healthy, pain-free living should be yours.